Made in India, early 1900s. 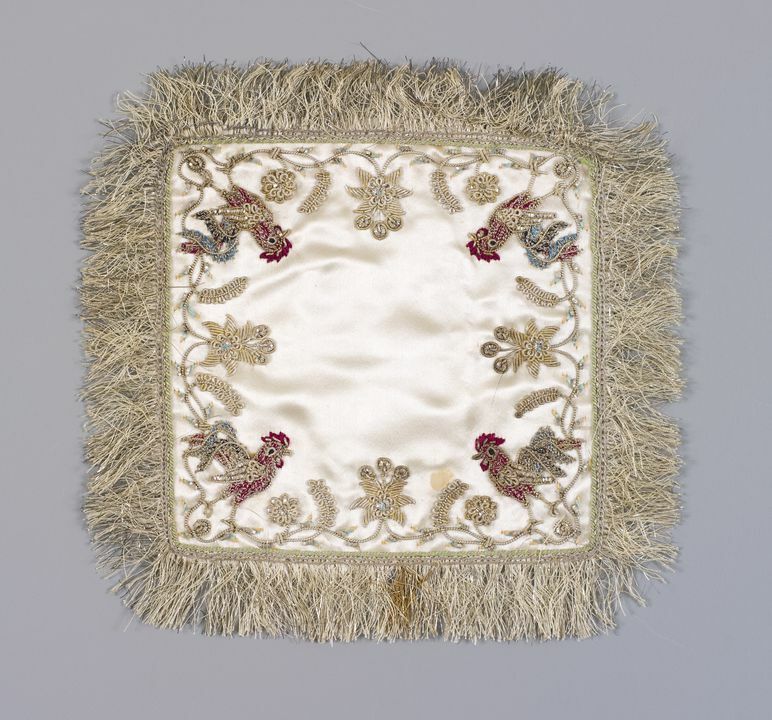 A set of fourteen square mats (two large and twelve small), of cream silk satin, heavily decorated with metallic silver bullion and floss silk embroidery through a cotton backing and edged with silk and silver fringes. The two larger mats have a deep floral border around a plain centre with the principal motif, a rooster, placed in each corner and a parakeet in the centre of each side between two large flowers. The roosters, parakeets and flowers are perched on or grow from small mounds. The smaller mats feature matching rooster designs with a more simplified floral design around a plain cream silk centre. All the mats are backed with lightweight cream silk. These mats were probably produced for the European export market by male professionals in an urban workshop in northern India during the early 1900s. The use of costly materials and high relief embroidery suggests special occasion rather than practical purposes. The ground fabric is cream silk satin onto which very heavy and intricate silver bullion embroidery known as zardozi has been worked, probably through a cotton backing for stability. The main motifs on the two larger mats, roosters, parakeets and flowers, are padded, with the bullion embroidery often worked over brightly coloured floss silks in blue, green, pink and gold; the roosters' crests are of red chenille. The smaller mats are decorated with matching roosters set in a much simpler floral border. Roosters, along with other birds, feature prominently in the iconography. Zardosi work has a long history in India and was frequently used to decorate the finest court dress. Metal of varying qualities is beaten and cut into fine narrow strips which are in turn coiled, bent and cut for application to the ground cloth using many different techniques to achieve different effects. In these mats, the following techniques have been mainly used: badla, flattened and twisted wire and dhabka, lightweight wire coiled and cut to form bullion beads. These mats originally belonged to the donor's parents-in-law, Stuart Gordon McFarlane (1885-1970) and his wife, Mary Grace McDermott. It is believed McFarlane and his wife acquired the mats on a stopover boat trip to India and they were passed down to their son, the late Sir Ian McFarlane, engineer and business entrepreneur, and thence to his wife Dr Ann McFarlane, the Egyptologist. In the course of his career Stuart McFarlane became the fifth Australian Secretary to the Treasury (1938-1948). He also worked for the Postmaster-General's Department, serving for some time in New Guinea and later in London as Official Secretary and Financial Advisor to S. M. (Viscount) Bruce at Australia House, 1936-1938. Embroidery has a long tradition in India, featuring strongly in both the rural and urban setting in the form of dowry goods, wedding paraphernalia and decorative items, such as these mats, for the export market. From the early 17th century until independence in August 1947, India was part of the British Empire. The practice of textile production during this era was inevitably deeply influenced by foreign rule. Newly industrialised Britain saw India as a developing market for their own burgeoning textile industry, with catastrophic effect on the Indian textile producers. The import of British textiles ceased however in 1925, thanks to Mahatma Gandhi, Indian political and spiritual leader, who emphasised the importance of India's domestic weaving industry as a tool in the struggle to be free of British rule. He argued that it was only by producing and wearing locally manufactured garments that India could become independent and self-sufficient.